Men’s work recalls like the sand of an hourglass the flow of times. The housebuilding has dug the hard rocks, abandoned on silent plateaus, castled on the top of the hills, between everlasting snow, sowed fields or near to rivers, small rocky pictures, changing their wonder every hour, to every light oscillation and to every turning season. Suburbs, which resounds of ancient bucolic stories, watcher of old legends, misterious histories lost in time, living in every narrow alley in towns and in the stories of old people in town. 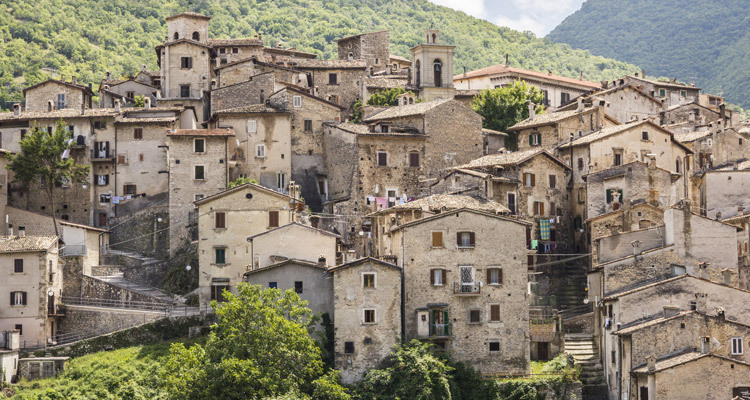 Small strengthened towns, built in defence to dangers, full of small streets, castled on rocks, with beautiful ancient and functional houses. Mysterious abbeys, abandoned since a long time, holders of the still throbbing mystical heart of the Region and of its attachment to religion. Heremitages, which got lost in holds valleys and tall mountains, watchers of memoriesof men, who searched God in nature and bent their knees in front of bad weather and ate its fruits in a lovefull bond. 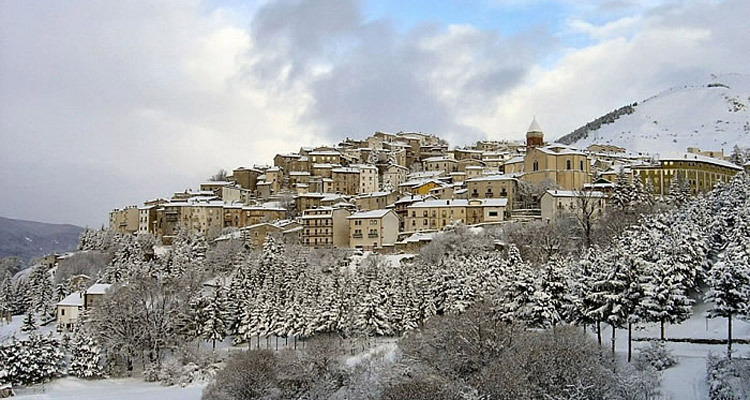 A trip on the everlasting enchant of Abruzzi, that holds perfume of Antiquity and the colours of flowing time. 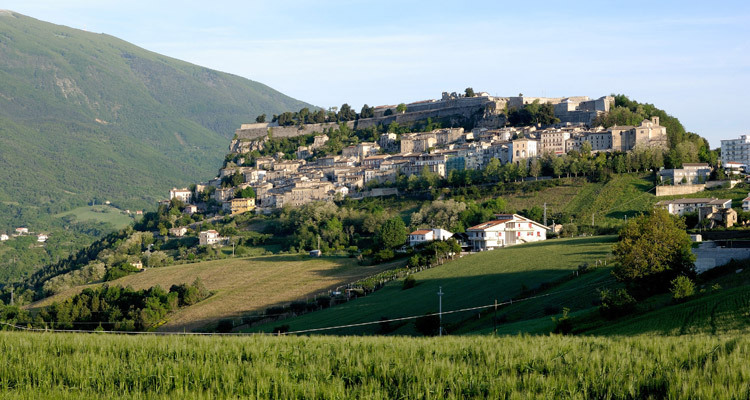 Anversa degli Abruzzi, a suburb of ancient origins, lies on the “Mouth” of the natural fascinating and tortuos route of the Gole del Sagittario and connects the Conca Peligna to the suburbs of Scanno and Villalago. Under the town rise the waters of Cavuto, a place of great naturalistic reliev, valorized by the protected Oasis of WWF. A “scarying and beautiful” route, a canyon that was created by the everlasting actionof the water onto a crowd of calcareous rocks’ layers, an ancient sea-ground,which was disappearing 200 millions of years ago. The ancient medieval suburb Anversa is sorrounded by a bounce of houses, built on hangs, named “Houses of the Lombardi”. The alleys and underpasses with arcs are very fascinating. We want to begin the visit of the town with the Church St. Maria delle Grazie, built in XVI Century, which facade is enriched by a Renaissance Portal in calcareous stone and a imposing rose window. The inside preserves ancient altars with grotesque incisions, a Statue of St. Rocco in coloured terracotta, made by a local craftsman, a tabernacle in gilded wood by Maestro De Picchi. On the first altar there is a reproduction of the magnificent Trittico of Anversa. St. Marcello’s Church, devoted to the patron since the XI century, exposes with boldness on its facade an elegan late-gothik portal with fanciful graven ornamental, anthropomorphous, vegetables, animal motives, embellished by a rare caltrop. The Norman Castle, built in XII Century, has been for years a strategic place for the sighting of invaders into the southern part of the Valle Peligna. Today the ancient tower still overhangs the underlying inhabitated area. The castle was for a long time Lords of Sandro’s home and hosted many artists and intellectuals. In front of the citadel of Anversa, right from the Gole, there is the old indipendent Feud of Castrovalva and its ancient monuments of the XI century: you come into the old Castrum without vestigias through an ogival portal. 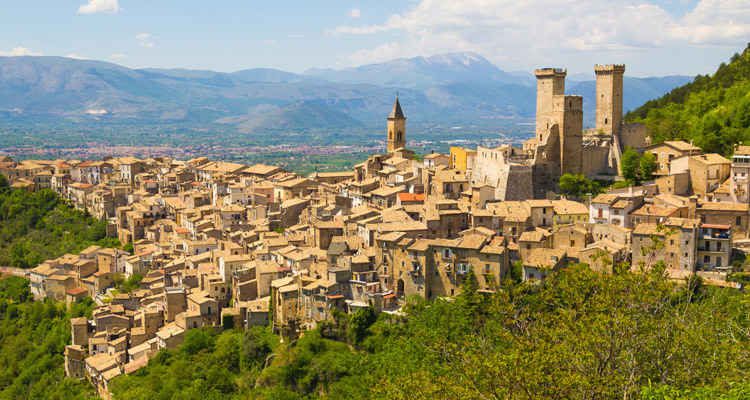 You have to visit: the little Church of St. Michele Arcangelo, city’s patron, built on the top of Mount St. Angelo andthe Parrocchiale St. Maria della Neve. The two suburbs are the examples of ridge installation, which are almost wholly preserved. Since the Renaissance there are shops and job-places of potters and teachers of embossed ceramics.